A Developer Analyst job role is very crucial and important; it includes analyzing and modifying the systems, reviewing and testing, encoding, decoding, debugging as well as the installation of support system applications. The other additional responsibilities of a Developer Analyst includes – performing system analysis, functional testing, troubleshoot applications, code modifications, resolve systems issues, software design, and development. As this task has a plethora of job duties to be performed, the incumbent should possess sound man-management skills apart from the regular educational and technical qualifications. 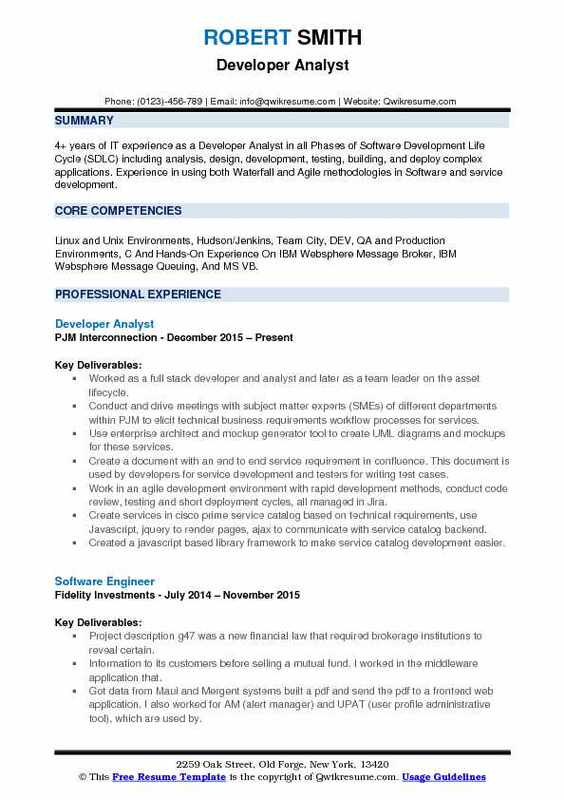 Normally for a Developer Analyst position, a hiring employer looks out for a degree in Science, Math, Computer science or IT in the Develop Analyst Resume Sample. However, an incumbent with key attributes in application development and programming can make an entry for senior level Developer Analyst Positions in top-notch IT companies. 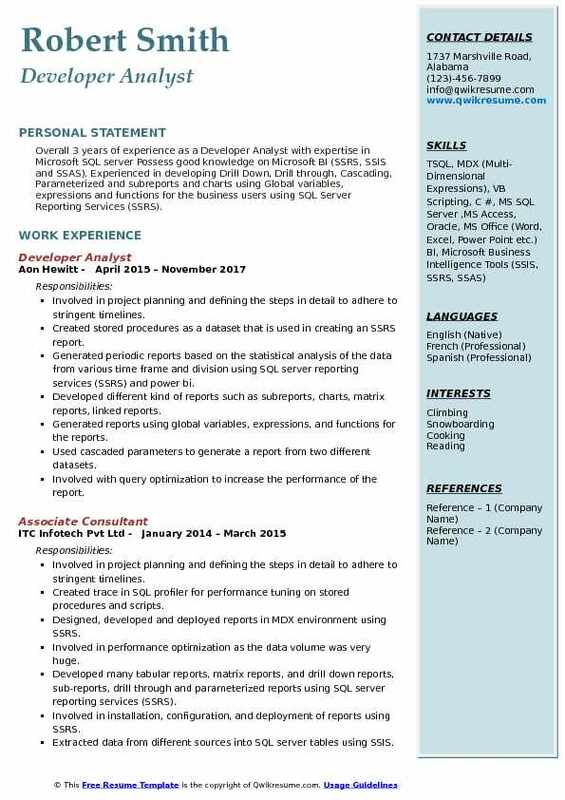 Summary : Over 12 years professional technical and analytical experience as a Developer Analyst, I would like to work in an organization that will give me a platform to utilize my technical abilities and enrich my knowledge in the process, to help incorporate growth with my initiative and managerial skills and to excel in dynamic corporate environment without overlooking basic values of life. 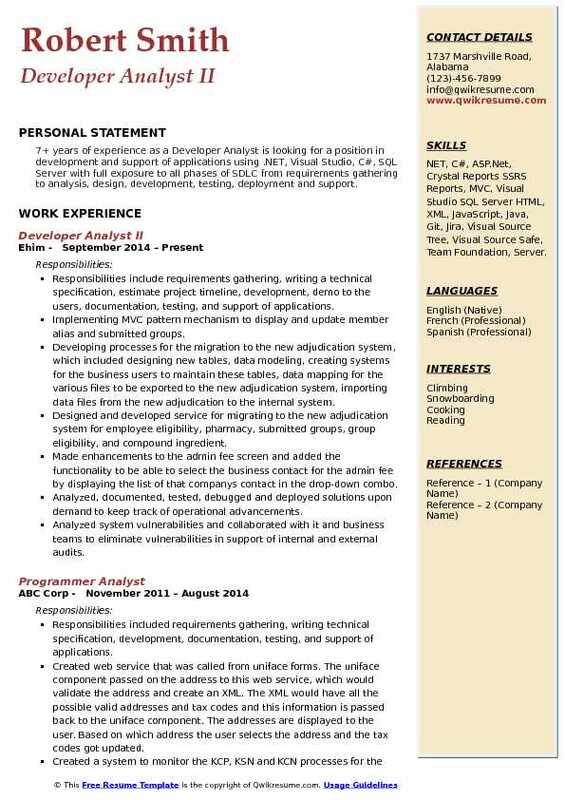 Skills : Visual Basic / VBScript / MS Access / SQL Server 2008 And 2016 SAP ABAP Developer / Analyst SAP Application Security, MS Office (Word, Visio, Excel, Powerpoint, Outlook, Access), Project Experience With Citrix, VPN, Sharepoint, VMWare, RDP, C++, Java, HTML/CSS, Adobe Ps And Ai. 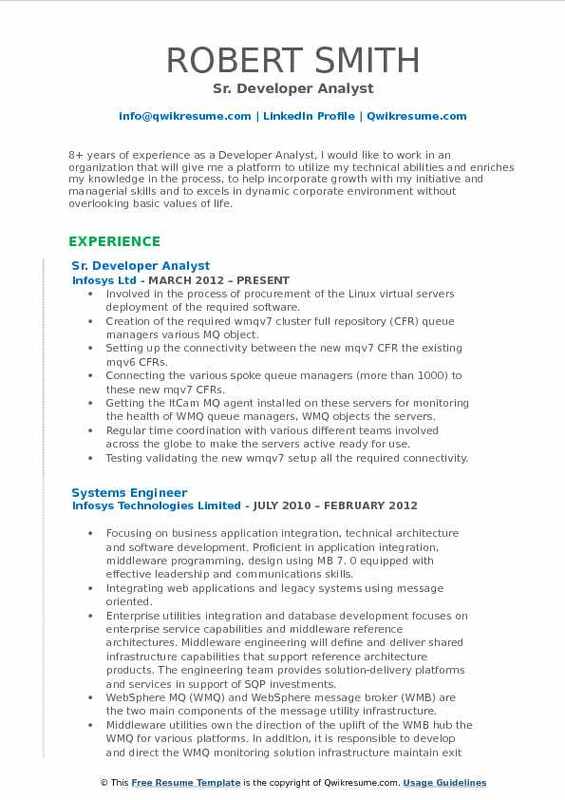 Provide application maintenance, and support, technical project assistant and analyst for various clients. Developer and application support of MS Access database with VB code utilizinSQLql server 2008 backend. An active participant in stakeholder meetings to identify, plan and design phases of SDLC. Custom application developed for finance team to track, document, follow up and report on insurance claim payments and/or denials. Creating and maintaining tables in SQL server 2008; tables linked in an application. GUI frontend created with multiple forms and reporting options for the team to research and update denial records. Creating an interface with files from star accounting system to import claims and denials data via daily windows scheduled task. Configuring data mapping using import specifications between the import files and data tables. Writing queries and code to process imported data to update tables and make denial assignments to active users. Included interface with ms outlook API to send notification emails from the database when import files were not found. Establishing user application access and security utilizing windows login credentials which allowed or denied access to certain objects based on the user. Conducting developer unit testing and coordinated user acceptance testing prior to application deployment. Authored detailed technical developer document as well as end-user training documentation. 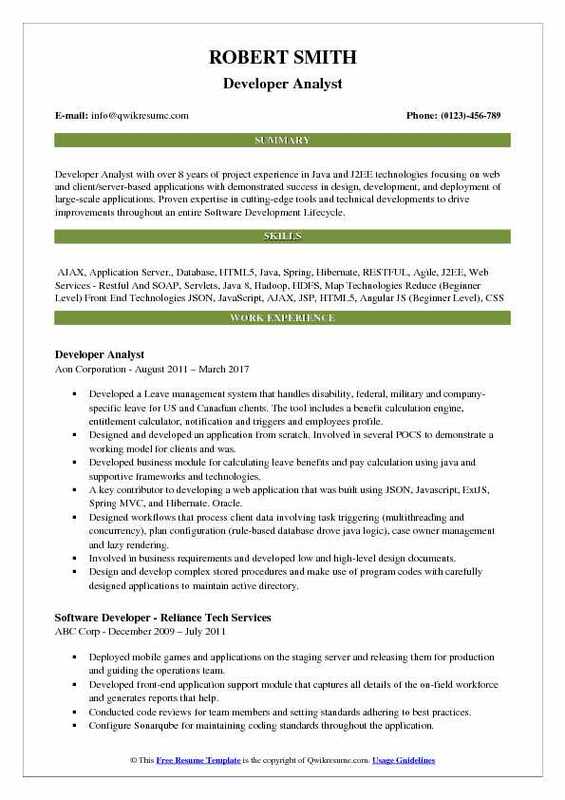 Objective : 4+ years of IT experience as a Developer Analyst in all Phases of Software Development Life Cycle (SDLC) including analysis, design, development, testing, building, and deploy complex applications. Experience in using both Waterfall and Agile methodologies in Software and service development. Skills : Linux and Unix Environments, Hudson/Jenkins, Team City, DEV, QA and Production Environments, C And Hands-On Experience On IBM Websphere Message Broker, IBM Websphere Message Queuing, And MS VB. Worked as a full stack developer and analyst and later as a team leader on the asset lifecycle. Conduct and drive meetings with subject matter experts (SMEs) of different departments within PJM to elicit technical business requirements workflow processes for services. Use enterprise architect and mockup generator tool to create UML diagrams and mockups for these services. Create a document with an end to end service requirement in confluence. This document is used by developers for service development and testers for writing test cases. Work in an agile development environment with rapid development methods, conduct code review, testing and short deployment cycles, all managed in Jira. Involved in working closely with the solution quality analysts by providing debugging and testing assistance as needed to meet sprint objectives. Summary : Developer Analyst with over 8 years of project experience in Java and J2EE technologies focusing on web and client/server-based applications with demonstrated success in design, development, and deployment of large-scale applications. Proven expertise in cutting-edge tools and technical developments to drive improvements throughout an entire Software Development Lifecycle. Developed a Leave management system that handles disability, federal, military and company-specific leave for US and Canadian clients. The tool includes a benefit calculation engine, entitlement calculator, notification and triggers and employees profile. Designed and developed an application from scratch. Involved in several POCS to demonstrate a working model for clients and was. Developed business module for calculating leave benefits and pay calculation using java and supportive frameworks and technologies. Designed workflows that process client data involving task triggering (multithreading and concurrency), plan configuration (rule-based database drove java logic), case owner management and lazy rendering. Involved in business requirements and developed low and high-level design documents. Design and develop complex stored procedures and make use of program codes with carefully designed applications to maintain active directory. Track, monitor and create company defects related to client applications using hp quality center. 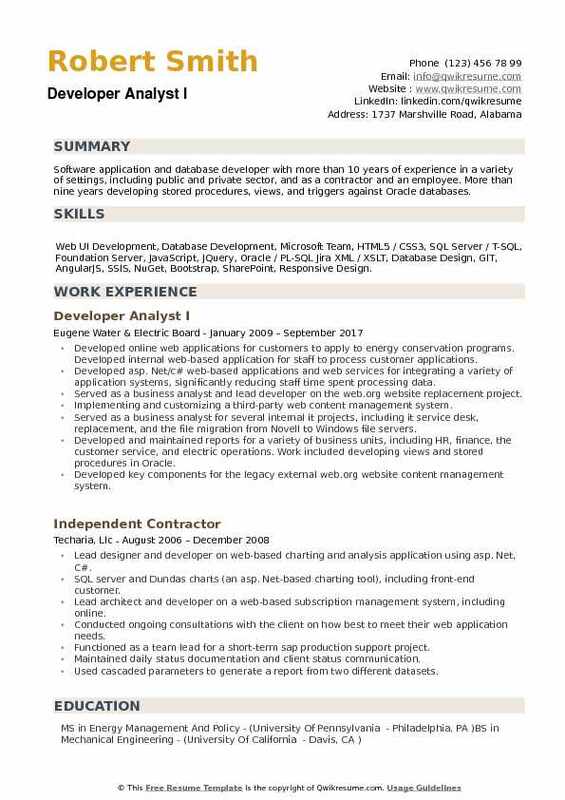 Summary : 8+ years of experience as a Developer Analyst, I would like to work in an organization that will give me a platform to utilize my technical abilities and enriches my knowledge in the process, to help incorporate growth with my initiative and managerial skills and to excels in dynamic corporate environment without overlooking basic values of life. Skills : Basic Knowledge of UNIX, LINUX SOLARIS, C And Hands-On Experience On IBM Websphere Message Broker, IBM Websphere Message Queuing, MS VB, Windows, Unix (AIX & LINUX), SOLARIS Tools: IBM WMQ 6.0 And WMB 6.0, IBM WMQ 7.0 And WMB 7.0, Software Packages: Microsoft Word, Excel, PowerPoint, Visio. Involved in the process of procurement of the Linux virtual servers deployment of the required software. Creation of the required wmqv7 cluster full repository (CFR) queue managers various MQ object. Setting up the connectivity between the new mqv7 CFR the existing mqv6 CFRs. Connecting the various spoke queue managers (more than 1000) to these new mqv7 CFRs. Getting the ItCam MQ agent installed on these servers for monitoring the health of WMQ queue managers, WMQ objects the servers. Regular time coordination with various different teams involved across the globe to make the servers active ready for use. Testing validating the new wmqv7 setup all the required connectivity. Providing consultation support to various application teams on WebSphere message queue (wmq), WebSphere message broker (wmb) other hub infrastructure related queries. Regular continuous discussion with the client, gathering the requirements then pass it on to the offshore team. Providing apt guidance and support to the offshore team maintaining a proper co-ordination between the onsite-offshore team. Involved with the process of procurement of the physical aix p520 series servers deployment of all the required software like wmqv7, wmbv7, db2, itcam etc. Objective : Overall 3 years of experience as a Developer Analyst with expertise in Microsoft SQL server Possess good knowledge on Microsoft BI (SSRS, SSIS and SSAS). Experienced in developing Drill Down, Drill through, Cascading, Parameterized and subreports and charts using Global variables, expressions and functions for the business users using SQL Server Reporting Services (SSRS). Involved in project planning and defining the steps in detail to adhere to stringent timelines. Created stored procedures as a dataset that is used in creating an SSRS report. Generated periodic reports based on the statistical analysis of the data from various time frame and division using SQL server reporting services (SSRS) and power bi. Developed different kind of reports such as subreports, charts, matrix reports, linked reports. Generated reports using global variables, expressions, and functions for the reports. Used cascaded parameters to generate a report from two different datasets. Involved with query optimization to increase the performance of the report. Built effective queries for high-performance reporting and rendered them to HTML, XML, pdf and excel formats using reporting services. 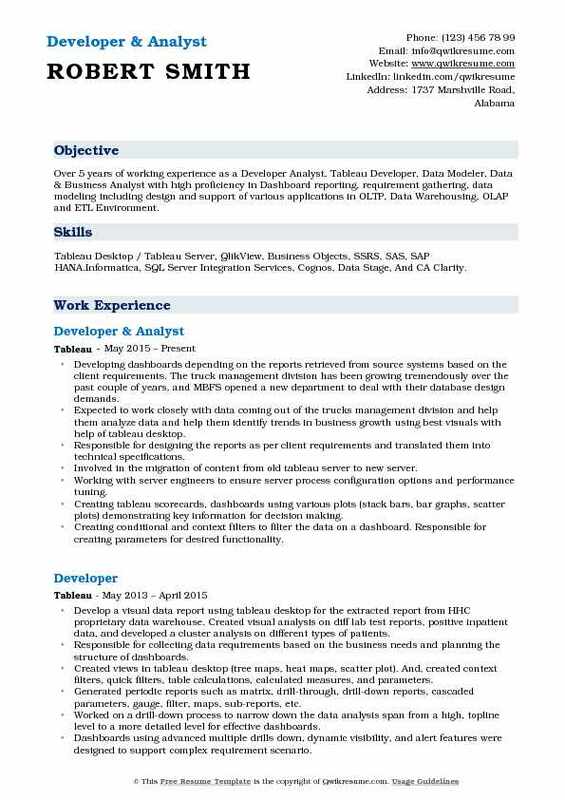 Headline : Over 5 years of working experience as a Developer Analyst, Tableau Developer, Data Modeler, Data & Business Analyst with high proficiency in Dashboard reporting, requirement gathering, data modeling including design and support of various applications in OLTP, Data Warehousing, OLAP and ETL Environment. Skills : Tableau Desktop / Tableau Server, QlikView, Business Objects, SSRS, SAS, SAP HANA.Informatica, SQL Server Integration Services, Cognos, Data Stage, And CA Clarity. Developing dashboards depending on the reports retrieved from source systems based on the client requirements. The truck management division has been growing tremendously over the past couple of years, and MBFS opened a new department to deal with their database design demands. Expected to work closely with data coming out of the trucks management division and help them analyze data and help them identify trends in business growth using best visuals with help of tableau desktop. Responsible for designing the reports as per client requirements and translated them into technical specifications. Involved in the migration of content from old tableau server to new server. Working with server engineers to ensure server process configuration options and performance tuning. Creating tableau scorecards, dashboards using various plots (stack bars, bar graphs, scatter plots) demonstrating key information for decision making. Creating conditional and context filters to filter the data on a dashboard. Responsible for creating parameters for desired functionality. Involved in extraction, transformation, on and loading of data directly from different source systems like flat files, Excel, Oracle, and SQL server. Working extensively with advance analysis actions, calculations, parameters, background images, maps, trend lines, statistics, and log axes. Working on data blending as well as newly introduced cross-database joins. Creating, organized, customized analysis and visualized projects and dashboards to present to senior level executives. Creating demos in tableau desktop and published onto Tableau test server. 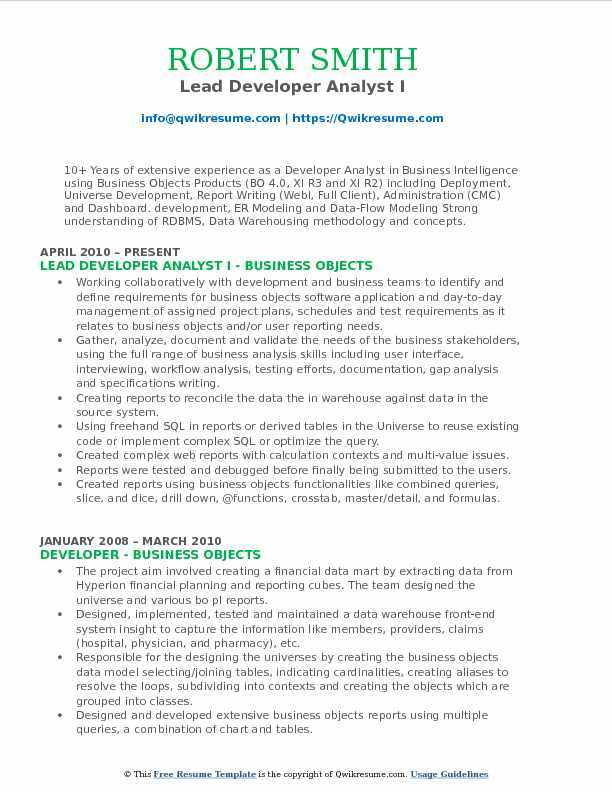 Summary : 10+ Years of extensive experience as a Developer Analyst in Business Intelligence using Business Objects Products (BO 4.0, XI R3 and XI R2) including Deployment, Universe Development, Report Writing (WebI, Full Client), Administration (CMC) and Dashboard. development, ER Modeling and Data-Flow Modeling Strong understanding of RDBMS, Data Warehousing methodology and concepts. Skills : Business Objects 4.0/XIR3/XIR2, QAAWS, Report Conversion Tool, Dashboard Manager, Designer, Crystal Reports Crystal Xcelsius ETL Tools: Informatica Power Center 7.x/6.x, Informatica Cloud Databases: Oracle My SQL, MS SQL Server MS Access Toad, SQL SQL, PL/ SQL, C++, VBA, , HTML 3.2/4.0, XML, DHTML, XHTML, CSS, Windows MAC OS X MS-DOS, Linux, UNIX, MS Office (Word, Excel, PowerPoint, Access, Outlook), ILife (iPhoto, iMovie), Final Cut Pro, 3D Studio Max, CorelDRAW, And Adobe (Photoshop, Illustrator, Dreamweaver, Flash, InDesign, Fireworks). Working collaboratively with development and business teams to identify and define requirements for business objects software application and day-to-day management of assigned project plans, schedules and test requirements as it relates to business objects and/or user reporting needs. Gather, analyze, document and validate the needs of the business stakeholders, using the full range of business analysis skills including user interface, interviewing, workflow analysis, testing efforts, documentation, gap analysis and specifications writing. Creating reports to reconcile the data the in warehouse against data in the source system. Using freehand SQL in reports or derived tables in the Universe to reuse existing code or implement complex SQL or optimize the query. Created complex web reports with calculation contexts and multi-value issues. Reports were tested and debugged before finally being submitted to the users. Created reports using business objects functionalities like combined queries, slice, and dice, drill down, @functions, crosstab, master/detail, and formulas. Responsible for creating complex and multi-dimensional reports using master/detail, crosstab, and subqueries. Working with database connections, SQL joins, cardinalities, loops, aliases, views, aggregate conditions, parsing of objects and hierarchies. Created web reports using drill down functionality within different hierarchies. Worked with team members to develop reports, analyze the reports and meet business leads on a bi-weekly basis to sign-off reports. 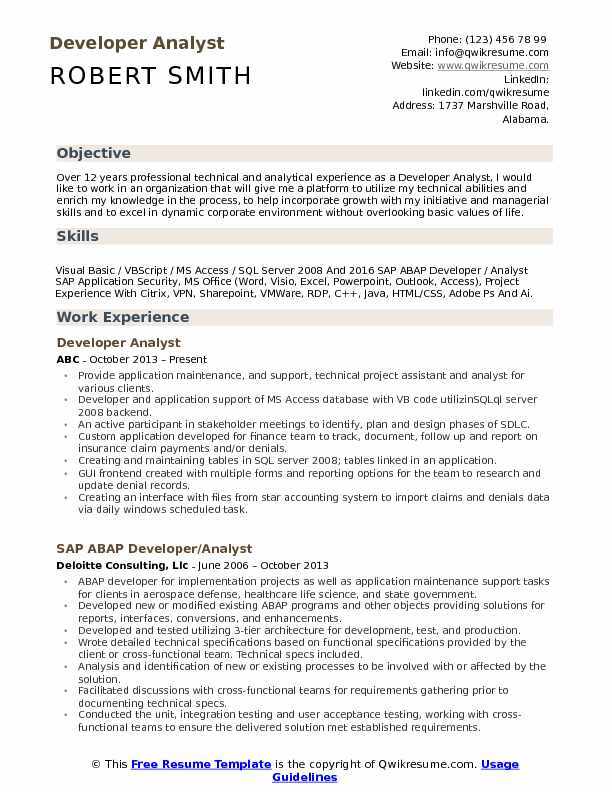 Summary : Strong 9+ years of experience as a Developer Analyst in SQL, Reporting and Integrating data warehouses. Motivated team player with demonstrated experience in collaboration with stakeholders to deliver excellent results. My work has been in Retail, Healthcare and Financial sector. Skills : PMP, Java, J2EE, JMS, JDBC, Struts, Spring, Oracle, JQuery, Glassfish ESB, Weblogic, Metastorm, MyBatis, Swing, FIX Protocol, Equities, Derivatives, Fixed Income, And FX Trades. Working for Sparx backend team with a focus on various functional aspects, such as recommendations, dynamic pricing, shipping estimations, personalized emails and bundles. Generating reports and visualizations based on areas of customer demography, institutional sales, logistical supply, corporate pricing, in-store statistics, trend analysis, powerpoint presentations, in-store vs. Online purchases, moving day sales outstanding (DSO) charts, corporate customer loyalty, market share, competition benchmarks with retailers like Walmart, Amazon, etc. Working on designed, developed and implement a bi solution for sales, shipping estimations, dynamic pricing and customer KPIs. Collecting ERDS from various departments and created reports and workbooks as per business requirements and analyzed users feedback to make enhancements to the newly created reports and documents from time to time. Creating various ad-hoc and automated reports on tableau workbooks involving large data cubes and views. Creating action filters, parameters and calculated sets for preparing dashboards and visualizations in the tableau. Creating all possible metrics for users to build their own reports on web and filters using the available metrics for cross-referencing. Using customer, product, payment, geographic and time dimensions and generated reports like forecasting and created user stories in tableau workbooks. Restricted data for particular users using user filters and row-level security in the tableau. Using the pl/SQL tables and records in transaction processing and bulk loads for ETL/ELT processes. Creating meetings and communicating business requirement and proposed system solutions. Using SQL tools like a toad, SQL Developer (Oracle) to run pl/SQL, SQL queries and validate the data pulled in reports. Summary : 7+ years of experience as a Developer Analyst is looking for a position in development and support of applications using .NET, Visual Studio, C#, SQL Server with full exposure to all phases of SDLC from requirements gathering to analysis, design, development, testing, deployment and support. Responsibilities include requirements gathering, writing a technical specification, estimate project timeline, development, demo to the users, documentation, testing, and support of applications. Implementing MVC pattern mechanism to display and update member alias and submitted groups. Developing processes for the migration to the new adjudication system, which included designing new tables, data modeling, creating systems for the business users to maintain these tables, data mapping for the various files to be exported to the new adjudication system, importing data files from the new adjudication to the internal system. Designed and developed service for migrating to the new adjudication system for employee eligibility, pharmacy, submitted groups, group eligibility, and compound ingredient. Made enhancements to the admin fee screen and added the functionality to be able to select the business contact for the admin fee by displaying the list of that company's contact in the drop-down combo. Analyzed, documented, tested, debugged and deployed solutions upon demand to keep track of operational advancements. Analyzed system vulnerabilities and collaborated with it and business teams to eliminate vulnerabilities in support of internal and external audits. Summary : Software application and database developer with more than 10 years of experience in a variety of settings, including public and private sector, and as a contractor and an employee. More than nine years developing stored procedures, views, and triggers against Oracle databases. Developed online web applications for customers to apply to energy conservation programs. Developed internal web-based application for staff to process customer applications. Developed asp. Net/c# web-based applications and web services for integrating a variety of application systems, significantly reducing staff time spent processing data. 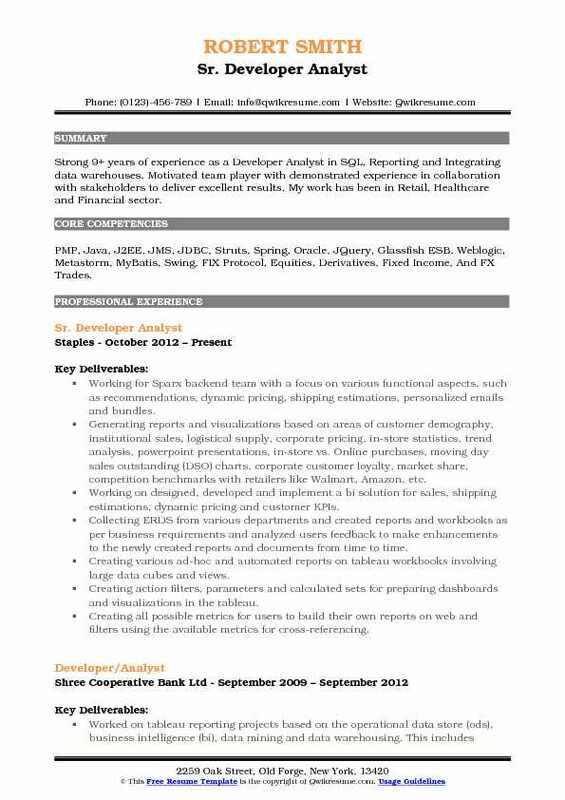 Served as a business analyst and lead developer on the web.org website replacement project. Implementing and customizing a third-party web content management system. Served as a business analyst for several internal it projects, including it service desk, replacement, and the file migration from Novell to Windows file servers. Developed and maintained reports for a variety of business units, including HR, finance, the customer service, and electric operations. Work included developing views and stored procedures in Oracle. Developed key components for the legacy external web.org website content management system. Served as technical lead on implementation team for the new Java-based HR information system.